This Traditional Roast Turkey with Pan Gravy is the perfect main dish for your holiday dinner! Prepare your turkey. Remove the neck and giblets, rinse, pat dry and place in a roasting pan. Using a mixer, whip the 3/4 cup butter. Add the fresh chopped parsley, sage, rosemary, thyme, and salt & pepper. Mix well. Warm up the butter/herb mix, just slightly. I put it in the microwave for 8 seconds…it’s just enough to soften the butter mix so you can rub it on the turkey. Roast for 35 – 40 minutes per 2 lbs, so a turkey of this size will need to roast for approximately 3 to 3 1/2 hours. 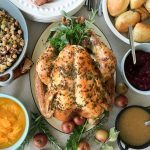 The turkey is done when the thigh meat reaches an internal temperature of 165 – 170 degrees F.
When the turkey is done, remove it from the oven, and place it on a large plate (keep the pan drippings! ), then cover it in tin foil and let rest about 15 – 30 minutes, and make your gravy. Take the pan drippings and pour them into a saucepan or large skillet. You should have about about 2 cups of drippings. If you don’t, you can use extra chicken broth. Keep the stovetop heat at medium. Whisk in about 1/4 cup of flour while the gravy boils. Whisk until smooth. If the gravy separates, add more chicken broth and flour and whisk until smooth. Tip: If you would like your gravy nice and smooth, you can use a hand blender. Taste the gravy then salt and pepper to your taste preference.